Need a quick wasp nest treatment in Essex? Call Buzz Bees pest control and have the Wasps Nest Removal Team eradicate your nest today. 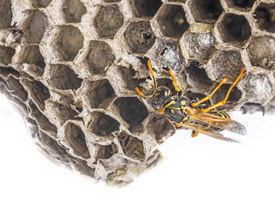 Let our pest exterminators take care of your potentially dangerous Wasps Nests. All charges are inclusive to a set fee, quality Wasp Control throughout Essex. If you are looking for Wasp Control in Essex or London contact us today. Once these eggs are laid, have hatched into larvae and then emerged as sterile female workers, a process which takes six weeks, she will concentrate on laying more eggs while these workers take over the building of the nest. The queen will carry on laying eggs until late summer, by which time the nest will have been expanded to contain between 5,000 - 10,000 wasps and larvae. By now a number of larger cells will have been constructed and are sometimes known as "royal" cells as they contain the larvae of the future queens. The Pest Control Officer will dust the nest or entry point using an insecticidal dust. The treatment is very quick and very effective. After the treatment there will be a significant amount of activity around the nest for three to four hours. The wasps should be completely eradicated within 48 hours. If the nest is active after this time, a revisit can be arranged. Once the wasps have been eradicated the nest will not be used again.